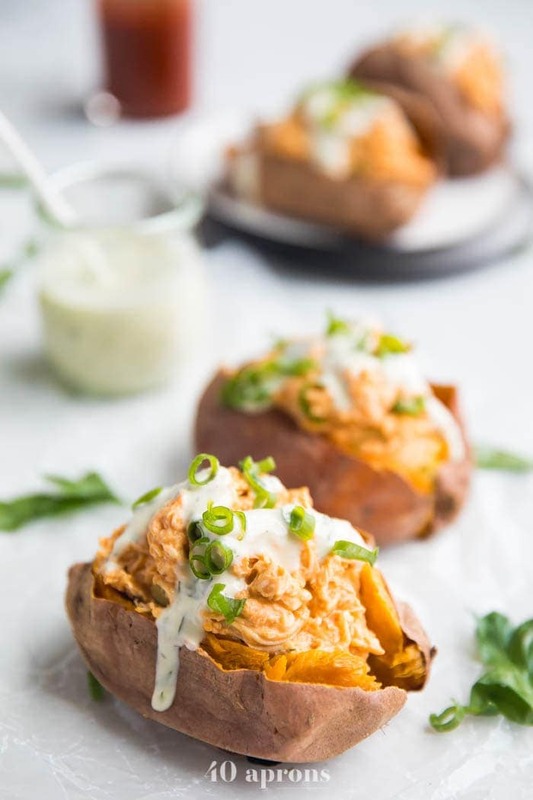 These creamy buffalo chicken stuffed sweet potatoes are healthy, super flavorful, and easy to throw together for a Whole30 or paleo weeknight dinner recipe. With only a few ingredients, these healthy stuffed sweet potatoes are family favorites! I need to talk to you seriously for a second. Are you paying attention? Look at me. In the eyes! OK, too close. Better. Good. Alright, here we go. 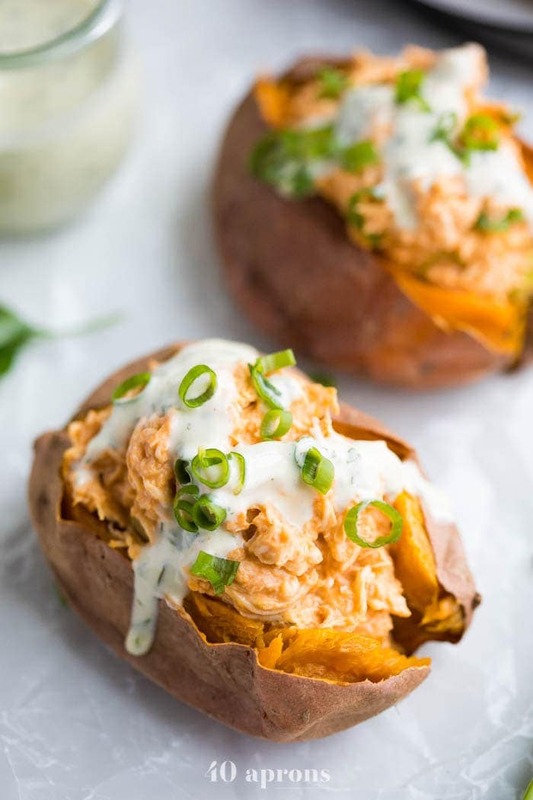 These creamy buffalo chicken stuffed sweet potatoes are my one true love. Don’t tell my husband, yeah? I’m trusting you with this secret (and the longevity of our marriage). Really, though, I fell in love with healthy creamy buffalo chicken recipes when I first made my paleo buffalo chicken casserole. It wasn’t your average paleo buffalo chicken casserole, though, sister. Nope – I loaded it up with coconut cream and ranch dressing, making sure the spicy, vinegary hot sauce settled softly into a rich creaminess. Because everything is better when it’s creamy, right? I literally cannot think of an example when that axiom does not hold true. It’s all in the name! 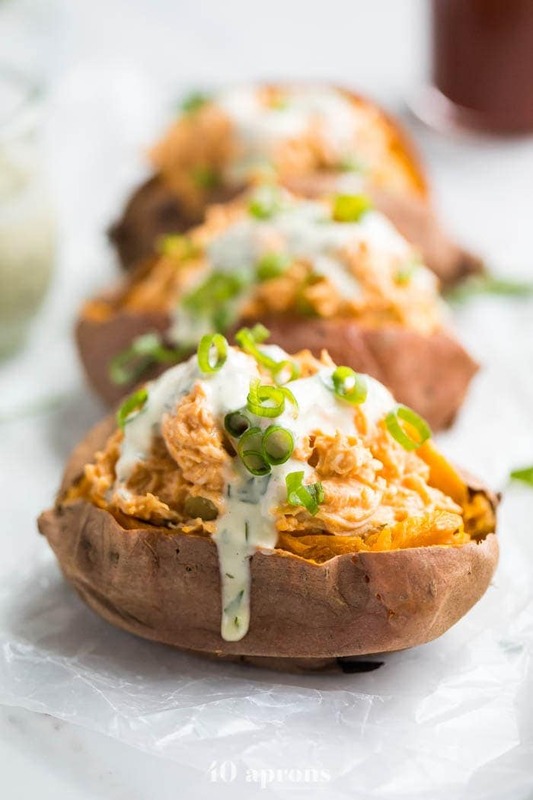 Creamy + spicy buffalo sauce + shredded chicken + filling and healthy sweet potatoes + lots of ranch dressing. All winners in my book. They’re super easy to throw together, since these healthy stuffed sweet potatoes use cooked chicken and just a couple other simple ingredients. These stuffed sweet potatoes are filling and oh so healthy. They’re paleo and Whole30 compliant, dairy free, and gluten free, too. I was inspired by my reader fave recipe, Mexican chicken stuffed sweet potatoes, but decided to pivot with another super flavorful twist: creamy buffalo sauce plus my best ever dump ranch recipe. I’m all about packing my recipes with loads of flavor, and these stuffed sweet potatoes are absolutely no exception. 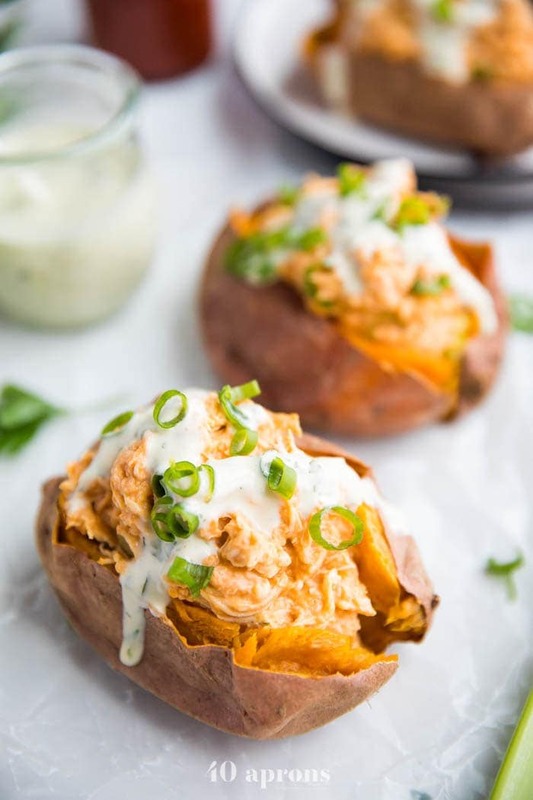 Want to make these healthy buffalo chicken stuffed sweet potatoes in the Instant Pot? Cook the chicken in the Instant Pot if you prefer: add the chicken and 1 cup water to the Instant Pot and cook on manual high pressure for 6-7 minutes (6 if you have smaller chicken breasts; 7 for larger). Let naturally release for 5 minutes, then quick release and remove from the pot. Discard water. Carry on with the recipe as written! Pick either 8 small sweet potatoes or 4 large. We eat 2 small stuffed sweet potatoes as a meal, and it’s a great portion size. One large stuffed sweet potato is fantastic, too! If you use large sweet potatoes, it may take more like 60 minutes for them to bake until they’re soft. Start checking around 45 minutes by squeezing them gently around the middle. Cover your hand with a towel or use a potholder to prevent your fingers from burning. Select sweet potatoes that are uniform in size. This will not only help with your portion sizes but will help them cook evenly as well. I use a stand or hand mixer to quickly shred my chicken. I roughly dice the cooked chicken breasts then use the paddle attachment on low speed to shred the chicken totally hands off! Start by baking your sweet potatoes and chicken. Season your chicken breasts with plenty of salt and bake about 25 minutes or until a thermometer inserted into the thickest part of the chicken breast reads 161º F. Prick your sweet potatoes all over and bake until soft, about 45 minutes. While the sweet potatoes bake, let your chicken cool slightly then shred. Try using a stand or hand mixer as detailed in the Tips section! In a small bowl, stir together all sauce ingredients, then pour over shredded chicken. Stir in white and light green parts of green onions. When sweet potatoes are soft, remove from oven and slice down the middle carefully. Steam will escape so make sure you’re using a towel or potholder to protect your hands (and keep your face away from the sweet potato, you crazy girl!). Let cool slightly. Stuff sweet potatoes with creamy buffalo chicken mixture. Top with more ranch dressing and dark parts of sliced green onions. Top with blue cheese crumbles if you’re into that (and not on a Whole30, of course!) and serve with celery sticks, if you’re into that, too. 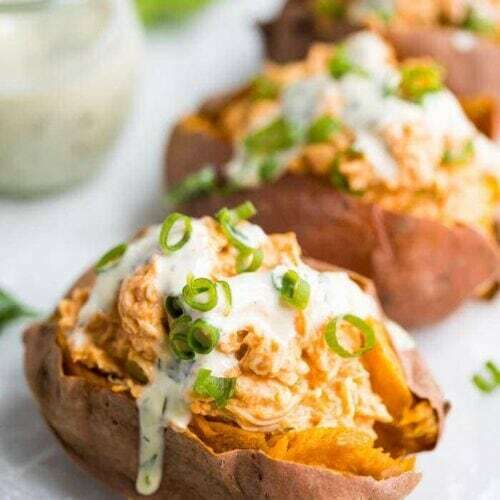 Healthy stuffed sweet potatoes filled with a creamy buffalo chicken. 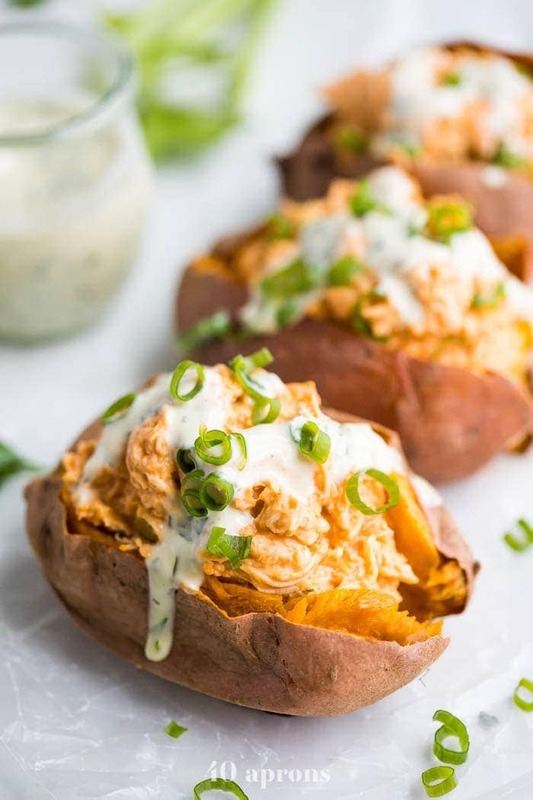 Whole30 and paleo, too, these buffalo chicken stuffed sweet potatoes make for a great and easy weeknight dinner recipe. Preheat oven to 400º F. Wash sweet potatoes and prick all over with the tines of a fork. Place on oven rack. Season chicken breasts generously on both sides with salt. Place in a baking dish and place in oven. After 20-25 minutes, or when thermometer inserted in the thickest part of chicken breasts reaches 161º F, remove chicken from oven. Continue to bake sweet potatoes another 20-30 minutes or until soft. While sweet potatoes bake, let chicken cool slightly. Shred chicken, either by hand with two forks or with a stand or hand mixer. In a small bowl, stir together all sauce ingredients until smooth. Pour over chicken and add white and light green parts of sliced green onions. Stir until well combined. When sweet potatoes are soft, remove from oven and slice down the middle carefully. Push ends in, using a towel or potholder to protect your hands, to open the sweet potato a little. Stuff with buffalo chicken mixture and top with more ranch dressing and garnish with dark green parts of sliced green onions. Sprinkle with blue cheese crumbles if desired (and not on Whole30 or dairy free) and serve with celery sticks (optional). If using precooked chicken, use about 3 cups diced. I can’t have anything too spicy, can I use less hot sauce? Any suggestions? Thank you. Made this tonight and it was so freaking gooooooooooooood!!! Everyone loved it. Can’t wait to try more of your recipes!! Thank you! !